Tulips are native to Central Asia. In the steppes of Kazakhstan and the foothills of the Pamir, Turks knew this flower and took with them on their long journey to Anatolia. The Ottoman sultans were big fans growing bulbs and gardens Istanbul color filled every year when spring. In 1554 the Austrian ambassador to the Porte saw a man wearing a turban tulip and asked for the name of the flower. However, man thought he wondered garment head and replied tülbend which means turban. Because of this, Flower was known in Europe as tulip, instead of his real name tulips. Every year in April, City Council celebrates International Istanbul Tulip Festival in Istanbul. This year they have planted 20 million tulips in all parks, flowerbeds and gardens of the city. If there is a time when the city tour has something special, It is during April. Tulips came to Europe from Anatolia twice. The first was during the Middle Ages, when Muslims of Al-Andalus were brought to cultivate in the Andalusian Gardens. The second is the best known, during the fourteenth century the Dutch became enamored of flowers arrived from Istanbul and became the national flower tulip. But where tulips appear to be in their true habitat is the area of ​​the Bosphorus. The Turks also consider the national flower and tulip can check it from the Ottoman ceramics, where flower tulips are more represented to the vessels themselves where they take tea, tulip shaped having. Gülhane Park 1 tulips million 68 types. Emirgan Park 2.308.000 Tulips 211 types. Parque Stars 830.000 Tulips 50 types. Parque Bulbous Plants 500.000 Tulips 56 different ftipos. Parque Beykoz 250.000 Tulips 16 types. Goztepe Rose Garden Gül 1.800.000 Tulips 150 types. Parque Great Çamlıca 500.000 Tulips 18 types. Parque small Çamlıca 610.000 Tulips 15 types. Fethipaşa Park 200.000 Tulips 21 types. 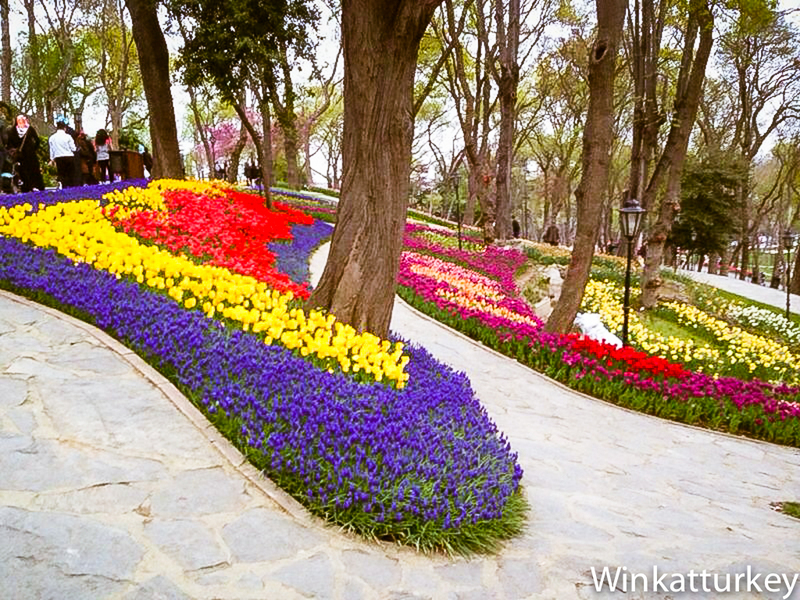 Hidiv Cubuklu Park 450.000 Tulips 23 different. As part of the festival events, women's tennis tournament will be held from 21 to the 27 April, There will also be an exhibition on the art of illumination in the Art Gallery of Taksim Square 7 to the 13 April. As we said, there will be a photo contest tulips and souvenirs throughout the month and crafts will be sold with tulip inspiration. Almost all the photographs in this post are the Emirgan Park, located below the second bridge on the European side, Festival del verdadero center. Thanks to Cristina for to go there and take the pictures for you all.